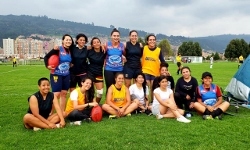 SEE BELOW FOR MATCH REPORT Latin America’s first ever women’s Aussie Rules match took place in Bogotá, Colombia on the weekend, as the Bogotá Bombers snuck past the Bogotá Bullants by a narrow 2 points. The first ever women’s goal was coolly slotted on the run by Bullants forward Jennifer, marking and playing on from a brilliant pass by Alejandra. The match tightened up immediately after, as both midfields fought hard to keep the ball in their half, led by captains Angela Toro (for the Bullants) and Karen Cifuentes (Bombers). Lizzeth Rachez moved back to shore up the Bombers’ defense, which lead to the ball staying predominantly in her team’s forward line for the remainder of the match. While inaccuracy plagued the Bombers, they eventually forced their way past the Bullants with goals from Daniela Cevallos.